Announcing the Afinia 3D Printer-Enhanced Educators eBook! Young adults and children are our future. As they continue to grow, they change our world with their thoughts and actions. At Afinia, we recognize how their thoughts and actions are influenced by educators and schooling, and therefore, how an education that emphasizes STEAM (science, technology, engineering, art, and mathematics) is extremely important. Many of our customers in the field of education have realized the benefits of including 3D printing in their classrooms and makerspaces, and have incorporated this technology into their lessons. Their passion and creativity are inspiring, and we wish to share their stories. 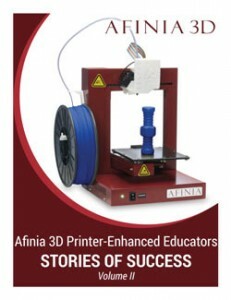 We’re proud to announce our second eBook, Afinia 3D Printer-Enhanced Educators: Stories of Success. Download the eBook and read about Afinia customers who have used their 3D printers to accomplish great things for education. If you’d like to read more stories of success, our first eBook can be accessed here, and our third eBook can be downloaded here.